iPad beware? The EeeKeyboard PC – Nice! After our previous alert for the iPad killer, here is another attempt. After much delays, Asus has finally rolled out its EeeKeyboard PC, a fully functional PC compressed into an all-in-one keyboard! 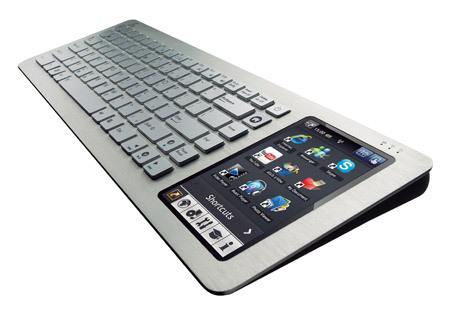 Weighing at about 2 pounds the Eeekeyboard was first introduced at the CES in 2009. The keyboard is loaded with features and its functionality just seems endless. The keyboard PC is capable of working with any HDTV, monitor or projector. The device is completely wireless and thanks to its Ultra-wideband wireless display connectivity that lets you stream HD 720p videos from a maximum of 5-meter range, Gimme! Did we mention that the keyboard has a built-in 5” multi-touch panel that is basically your onboard video. The device is being hailed as a desktop “space saver” where it can offer the same performance while minimizing cable clutter and multiple computer components. The device also is loaded with a shock-proof Solid state drive for increased performance along with a microphone and high quality stereo speakers. The specs are particularly interesting. The EeeKeyboard PC comes loaded with Windows XP Home and runs a Intel Atom N270 on a 945GSE/ICH7-M chipset and boasts of a 1GB on-board memory. Two SSD options are available, a 16GB and a 32GB SSD. The device supports a decent 802.11b/g/n,10/100/1000 Mbps Ethernet connection,Bluetooth V2.1,Internal battery (up to 4 hours). For having a 5” display the battery life is not particularly impressive. The EeeKeyboard is priced at around $599 which is quite a bit. There is no news about when the keyboard will actually start to ship. In the era of a $499 iPad, I am not sure if this will be a success?